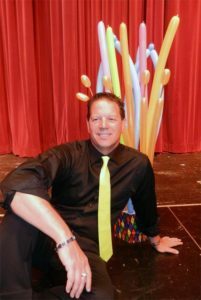 Veteran Entertainer: Ensures th at no unexpected pop will deflate the fun. Contract: Making sure nothing is forgotten, left out, or missed. A Birthday Party is fun when you’re attending, but hosting can be overwhelming. You know your kids will listen, but the neighbor’s kid, look out. What a handful. Most parents look for activities to entertain the kids. It can be a simple game like a hot potato to a craft project. Other parents will hire a professional balloon entertainer to come and keep the kids entertained at the birthday party, while other parents will spend a small fortune renting out an arcade and letting the kids run wild. As a professional kid’s entertainer, I have been at 100’s of birthday parties and have learned the best entertainment for a child’s birthday party is a party that includes the adults. The benefit of entertainment; make people talk about your event, especially if the entertainment focuses on both the kids and adults. Keep in mind that this is a party; Yes- a kid’s birthday party, but a party. Everyone should be included in the fun. Having adults attend the birthday party helps the host with kid control, cleaning up, and have extra eyes to watch out for dangerous situations. It can be overwhelming for one parent to control 15 screaming, six and seven-year-old kids. An unseen benefit, for attending parents, is sharing a memorable experience with their child. Any fears that a child has, their parents are there to comfort or correct their behavior. Make the birthday party fun for everyone young and old; hire entertainment that will be memorable and entertaining to everyone attending the party. “Dale – I am so thankful that you were a part of my daughter’s 2nd birthday celebration. Your balloon creations are one-of-a-kind. I’ve never seen so many unique designs. This combined with your great personality puts you over the top”. Simply provide a location, time, and date and I will send you a contract confirming the event booked. I arrive 10-15 minutes before the designated start time to ensure your party starts on-time! When you book your event, Dale will confirm the time and location. Once this has been done, Dale will add your event to his show calendar and you will receive an email inviting you to your own event. This tells you that Dale has recorded your event into his books and has started the contract process. Please review the calendar entry and look for a contract to be emailed to you. The contract will allow for an electronic signature which requires no scanning, just a quick signature and send.